A website is a crucial tool that must be in every business’s quiver. You want people to visit your website, explore your products or services and do other actions. But what if they are not coming to your site? What if your website is not getting traffic? What if people are visiting but leaving straight away? For both businesses and SEO companies driving traffic to a website is not easy. If you are business and looking for SEO packages that can help you increase your website traffic, you should make your choice wisely. If someone claims to boost your website traffic overnight, you should be aware of this. They might be trying to lure you to hire their services for website optimization. Everyone is building a website and toiling hard to get more traffic to their website. But to sustain in the game and get an edge, you need to have a strong strategy. You need to be equipped with the best of skills and techniques used to increase website traffic. 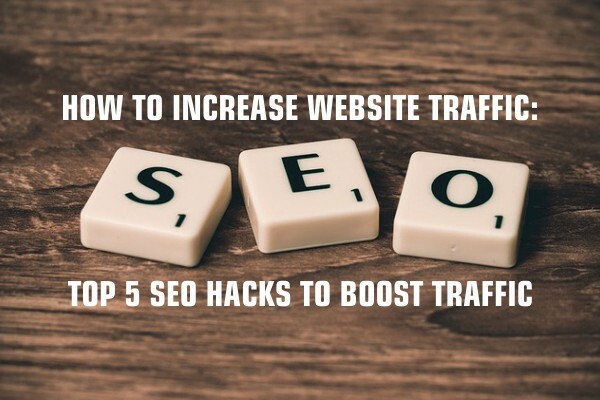 Whether you are business firm and you don’t want to hire an SEO marketer or an SEO company providing website optimization services, these are some simple and highly effective SEO tricks that will certainly help you significantly increase your website traffic. This is the first step towards your effort for increasing website traffic. If you want to truly increase website traffic, your website content must be optimized. Or the traffic you get will not last and stay with your website. It is the first step you need to take. If you know your current traffic status, it would be easy for you to come out of the strategy that best works to increase the traffic. Setting up Google Analytics tracking code will help you track the traffic coming to your website. You can also get a traffic report on Google Analytics. Use these metrics to track and analyze your website traffic. Keep tracking your traffic so you know whether you are losing or winging. This is where most businesses even SEO companies fall off the track. Either they do not have the one or if have the one not efficient enough to yield the desired result. Research by Content Marketing Institute shows those without the right strategy fail to make to it. Inversely, those who have a strong strategy are more likely to succeed in pulling in the traffic to their website. What type of marketing you create for your content marketing, make sure to keep in mind your goals, audience, the value you offer to them, the channels where you would like to distribute your content. Create content that provides users a great value as well make them take the action you want. Internal linking refers to adding links from one page on your website to another page on your website. You can add links in one blog post to older posts, or from one page to other pages. And thus, internal linking encourages visitors to browse through other pages on the website. If a visitor jumps from one page to another page, this is counted as one more traffic. Spammy, irrelevant content not just hampers your credibility but also kills the ranking of your website. And this ultimately does have an impact on website traffic. It is important to audit the content so you can learn about which content brings traffic and which not. This will allow you to track traffic coming from a blog post. So you can understand what people are visiting your website to look for. And you can create more that kind of content. Once your website is prepared to get traffic, you need to create content if needed and share it as much as possible. The more your content is shared, the more it gets traffic. To make the most out of every post you share it is important that you choose the right platform, and optimize the post for that platform. Here are tips on how to share your content for better results. Your posts appear differently on each platform. Make sure you optimize it for each platform so you get the best result. For example, if you want to post Facebook, your content should have the following elements. Consistency is crucial to the success of your content marketing. Share your posts on a regular basis. Creating a schedule will help you to maintain this and never miss to share a post. If a post doesn’t get shared or liked or viewed, this means there is something wrong with the post. This might be spammy, and so you should stop trying reposting it the same way. This will turn your audience away if you keep doing it, and also search engines hate spammy content. Make it easy for users to share the post. So use sharing buttons either at the bottom of the post so if the reader finds the most valuable and think this can be useful for others as well, they will easily share it. Social media is one part of the game. It is an effective way of getting your content in front of new audiences. These are some of the ways you can increase your content exposure to the right audience. Guest posting helps improve your SEO rank, and it also introduces your content to new audiences. Write at least 2 to 3 guest posts a month and get them published at the websites where your potential customers more often visit. · Start Building an Email list: A study shows RoI of email marketing is higher than social media. It gets traffic as much as search engines. · Set up email follow up to ensure consistent recurring traffic: This will help you keep your potential customers updated with your content –no matter when they join your newsletters. · Create a push notification list: This works and can increase the click-through rate by 6% or so. A single piece of content can be broken into different pieces such as a piece of long-form content can be turned into a bunch of slideshares. Choose the format you would like to repurpose your content based on the channel and what the post talks about. · Repurpose your content into different bits: Keep the quantity along with quality as more content you create, the more result you can expect. · Dissipate the content on the right channel: Medium also has a bit of impact on the traffic a post gets. So it is crucial to choose the right medium for each of your repurposed content. Whether you want to increase your brand visibility or boost revenue by increasing sales, traffic is one of the most crucial factors. In fact, it is the foundation of all your online marketing efforts. These are tricks are effective and anyone, whether it is a business or an SEO company providing SEO services, can easily implement to increase website traffic. Media Search Group has the creative competence and expertise in technology for developing the websites.